In the early hours of the morning of Friday, August 23rd 2013 the Israeli Air Force struck a target at a location south of Beirut in response to the missile fire on communities in northern Israel the previous afternoon. 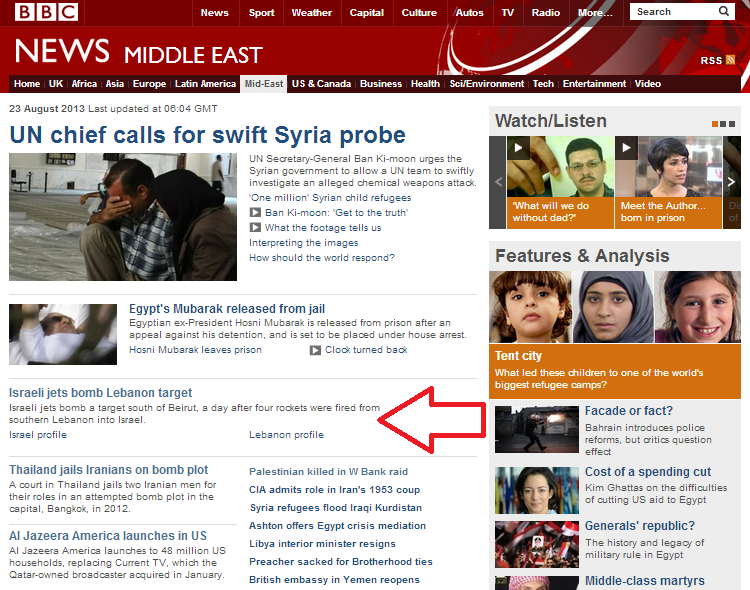 The BBC news website’s Middle East page carried an article originally titled “Israeli jets bomb Lebanon target” and later amended to “Israeli jets bomb Lebanon target after rocket strike” on Friday morning, with its prior report on the missile fire itself having been taken down from the page. “Israeli jets have bombed a target south of Beirut a day after rockets were fired from Lebanon into Israel. They targeted a “terror site” near the coastal town of Naameh, between Beirut and Sidon, the Israeli military said. Despite the fact that it reports that a terrorist organization designated by the United States, the European Union, Canada and Israel “said one of its bases had been hit”, the BBC apparently cannot appreciate the cognitive dissonance of the use of scare quotes around the phrase “terror site”. In fact, the PFLP-GC apparently does not even merit the standard BBC “militants” euphemism for terrorists and the casual reference to its “support” for Assad whitewashes its involvement in the Syrian civil war. One of course doubts that the BBC would be busying itself quite so much with the grading of “damage” had four missiles been fired at British civilians in an unprovoked attack on, say, Gibraltar or Belfast. Yet again the BBC fails to make it sufficiently clear to audiences that terrorists have been firing missiles at Israeli civilians from Lebanon for over thirty years – not just since August 2006. Neither does it bother – again – to make any attempt to inform readers that such missile fire and the very presence of armed terrorist militias in southern Lebanon (including Hizballah) are breaches of UN SC resolution 1701 which brought an end to the Second Lebanon War and the ensuing significance of incidents such as this latest one. The ‘nothing to see: move along’ approach adopted by the BBC in both these articles about Thursday’s missile attacks is certainly not contributing to fulfilling its stated mission to “enhance UK audiences’ awareness and understanding of international issues”.